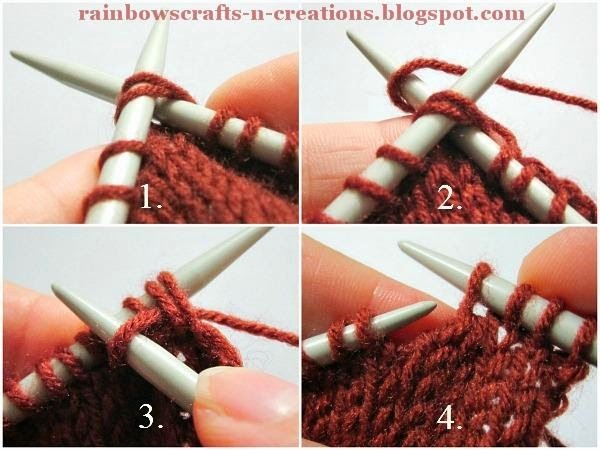 How to make a decrease stitch in knitting? Basically, single decrease stitches in knitting can be divided into two categories : right-slanting single decrease stitch and left-slanting single decrease stitch. 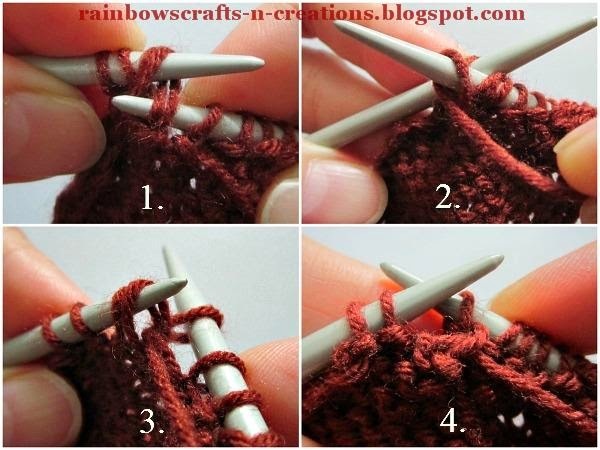 There are different ways to make both single decrease stitches on the knit side and the purl side of a knitting piece. The method that I always use to make a right-slanting single decrease stitch is either K2tog (knit two together) or P2tog (purl two together). K2tog is worked on the knit side and P2tog is worked on the purl side. Usually, I apply these two decrease stitches only at the left side of my knitting piece as these create a slope to the right on the face of the piece respectively. 1. Insert the right needle from front to back through the front loops of two stitches on your left needle at once. These two stitches should be the stitches where you want to make a decrease stitch. 2. & 3. 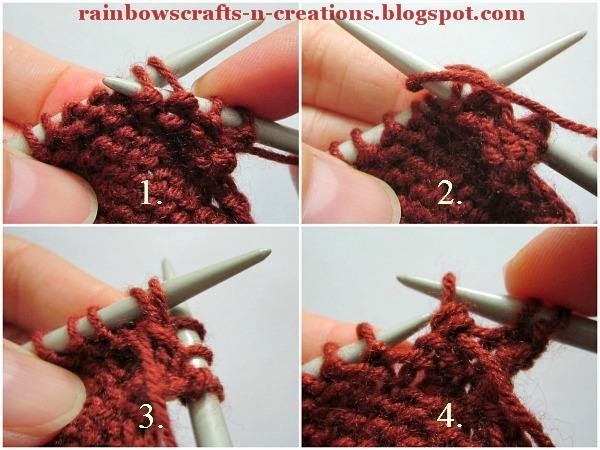 Knit the two stitches together as if they were a single stitch. 4. Then, slip it off the left needle. You have just decrease one stitch on the knit side. 1. Insert the right needle from back to front through the front loops of two stitches on your left needle at once. These two stitches should be the stitches where you want to make a decrease stitch. 2. & 3. Purl the two stitches together as if they were a single stitch. 4. Then, slip it off the left needle. You have decreased one stitch on the purl side. The method that I always use to make a left-slanting single decrease stitch is either K2togtbl (knit two together through the back loops) or P2togtbl (purl two together through the back loops). K2togtbl is worked on the knit side and P2togtbl is worked on the purl side. Usually, I apply these two decrease stitches on the right side of my knitting piece as these create a slope to the left on the face of the piece respectively. 1. Insert the right needle from front to back through the back loops of two stitches on your left needle at once. These two stitches should be the stitches where you want to make a decrease stitch. 2.& 3. 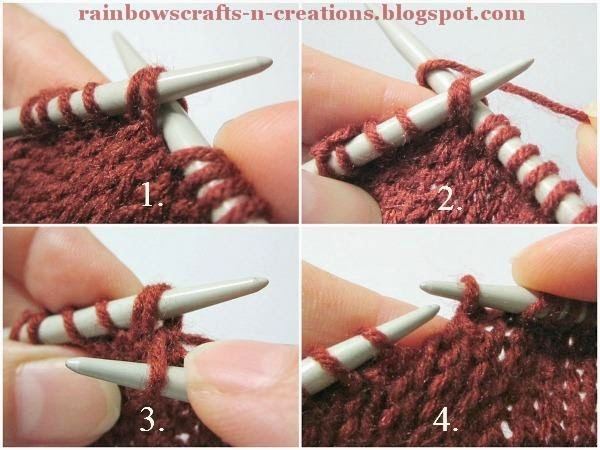 Knit the two stitches together as if they were a single stitch. 4. Slip it off the left needle. You have just decreased one stitch on the knit side. 1. Insert the right needle from back to front through the back loops of two stitches on your left needle at once. These two stitches should be the stitches where you want to make a decrease stitch. 2.& 3. Purl the two stitches together as if they were a single stitch. 4. Slip it off the left needle. You have just decreased one stitch on the purl side. You will see the result after you knit for a couple of rows. If I wanted to make decreases on the knit side and on the purl side, I would make sure the decreases worked the same way on the both side. So, When I make K2togtbl on the right and K2tog on the left of the knit side of a knitting piece, then I would make P2tog on the right and p2togtbl on the left of the purl side of a knitting piece.